You can create a flipbook using multiple PDF files. Using our Upload PDF editor, you can upload multiple PDF (or JPG) files either by clicking the Upload files button or simply by dragging and dropping your PDF files in our editor. Once you have all your PDF files uploaded, you can rearrange them by clicking and dragging them into place. 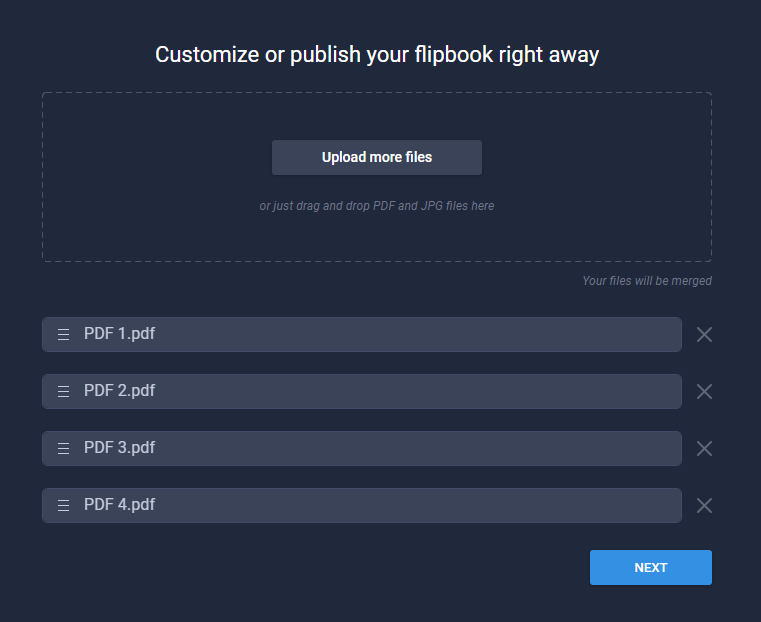 Once you are happy with your uploaded PDF files and their position, simply click Upload files to generate your flipbook using multiple PDF files. Important: once the Next button has been pressed, all your PDF/JPG files will be merged into one and you will no longer be able to unmerge them in the Upload tab. For more information about Flipsnack's upload functionality, please read this article. For a list containing the PDF file limitations per each subscription, please read this article.